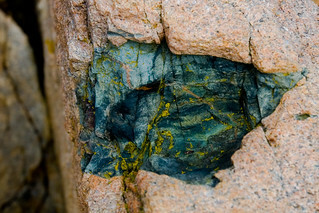 As I was traversing the granite boulders in my attempt to photograph Bass Harbor Head Lighthouse I noticed this interesting and beautiful formation. I was amazed by the geologic complexity and investigated it as I wondered what processes must have been involved in its formation. I was also struck by the thought of the tens of millions of young earth creationists in this country who believe the earth is < 10,000 years old. The evidence is clear and there can be only one of two explanations: either a supernatural god created the world and made it look really old or it is, in fact...really old.